Whole Foods Market is nearing a milestone with the opening of its 500th store. The Austin, Texas-based specialty grocer said Thursday that on April 5 it plans to open a 70,000-square-foot, multilevel store in midtown Atlanta at 22 14th Street NW. The company described the store as its flagship location for the Southern region. It has 11 other stores in the Atlanta metropolitan area. Currently, Whole Foods has 497 stores, including 476 in the United States, 14 in Canada and seven in the United Kingdom. Its 498th location, announced earlier this month, will be a 30,000-square-foot store in Evergreen Park, Ill., slated to open March 6. 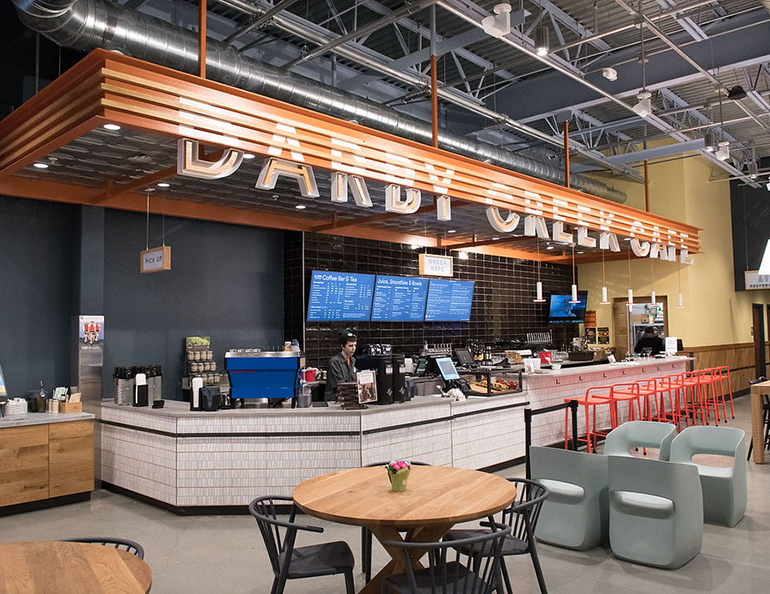 The Darby Creek Café at the recently opened Whole Foods in Newtown Square, Pa.
A company spokesman said that next week the chain plans to announce its 499th store, but he declined to disclose the location. That store will open before the midtown Atlanta site, he added. Earlier this year, on Jan. 18, a 51,000-square-foot Whole Foods opened in Newtown Square, Pa. Whole Foods’ store count has risen by about 30 units since the closing of its acquisition by e-tail giant Amazon.com Inc. for $13.7 billion in late August 2017. At the time, Whole Foods had 468 stores overall. Under Amazon, Whole Foods has boosted its omnichannel presence via the Prime Now program. Most recently, the companies expanded Prime Now curbside pickup to Whole Foods stores in 22 market areas. It launched the service in early August in Sacramento, Calif., and Virginia Beach, Va. Prime Now delivery also has expanded steadily since its February 2018 debut and is now offered at Whole Foods stores in 63 cities. Whole Foods, too, is scaling back its brick-and-mortar format. In mid-January, the company confirmed plans to discontinue the opening of Whole Foods 365 stores, and this week published reports said the current dozen 365 stores would shift to the conventional Whole Foods Market banner. When introduced in May 2016, the 365 concept was billed as offering lower prices than a typical Whole Foods store in a much smaller format with a streamlined product selection and a more local flavor. At the same time, Whole Foods has continued to differentiate its stores with unique offerings and services. The retailer said it’s positioning the new midtown Atlanta store as a community gathering spot. For example, the location will house four fast-casual eateries across four floors — including a rooftop bar with skyline views — and the eateries will offer exclusive food menus and curated selections of locally sourced beer and wine. Also in the store will be a “fruit and vegetable butcher” offering cut-to-order fruit and vegetables, as well as a meat-cutting room with “old-world style” butcher services, Whole Foods said. Meanwhile, the Newtown Square features the Darby Creek Café, an in-store, fast-casual eatery serving a pub-inspired food menu with dishes made in a wood-fired oven, including vegan and vegetarian options. Also offered are curated selections of local spirits, sherry-based cocktails and cold-brew coffee, juice and local beers on tap. The café has three televisions and will offer outdoor seating during the summer months.